I’ve also resurrected my photo gallery at 500PX. Currently, I’m adding pictures Toronto pictures from 2007, including some photos of the old Port, UofT and the Annex area, Cherry Beach, and so on. Guess I can’t complain too much since I don’t remember the last time I actually bought something there. 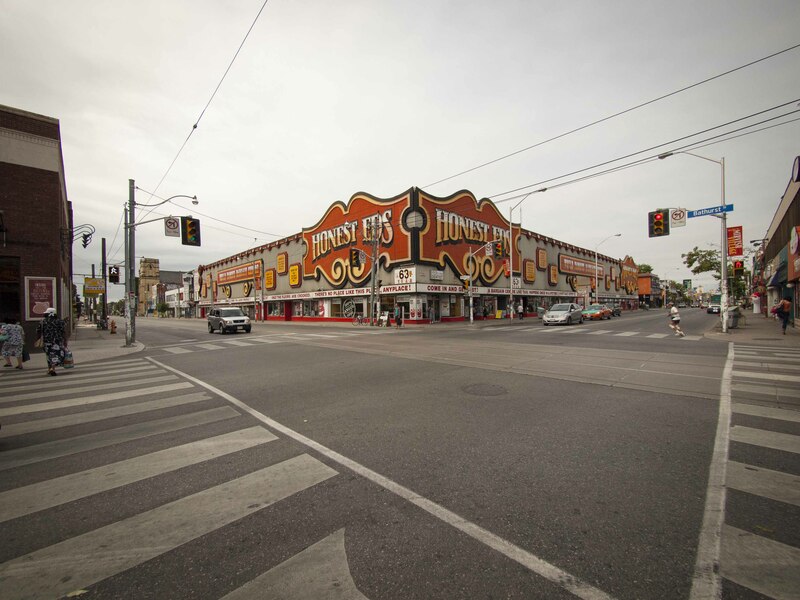 But I doubt that whatever use the land is put to next, it will have the same impact on local character as the Honest Ed’s the store and Honest Ed (Mirvish) the man. The last time I saw him he had just turned 90, and was having a birthday bash on the patio of the restaurant across Markham from the store. A mounted police officer rode his horse up against the patio fence to wish Ed a happy birthday. The next day, as R. and I were getting on the subway, the PA system came to life: “Mr. Mirvish, it’s an honour to have you on board.” He had an impact on people, as in the video below “Ed Mirvish’s Bench” put out this summer by Spacing magazine: Canadian urbanism uncovered. Oldness, and history, makes us feel connected with the past. They make us feel like we’re living as part of some grander, more meaningful, continuity of existence – let’s call it “civilization” – and not just puttering around glass towers in carefully laid-out micro-communities in our complicated shoes, hauling around our yappy small dogs, until we die, interred to the earth in a brushed mahogany condo-coffin.